H.E. Soylu was born in Istanbul on November 21st 1969. After completing his high school training at Plevne High School, he graduated from Business Administration Faculty of Istanbul University. Having started his political career in 1987, H.E. Soylu served as the District Chairman at the Youth Branch and as the Deputy Provincial Chairman. H.E. 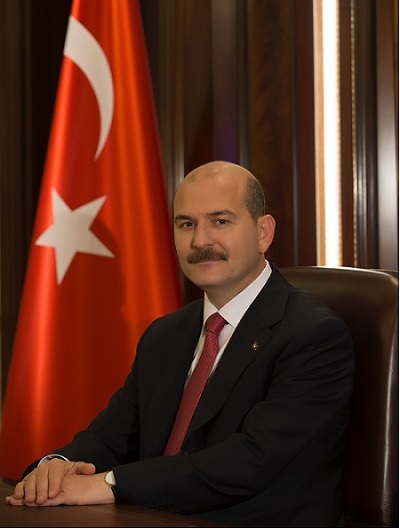 Soylu served as Chairman of the Party in Gaziosmanpaşa District between 1995-1999 and as the Provincial Chairman of the Party in Istanbul between 1999-2002. H.E. Soylu acted as General Chairman of the Democratic Party from January 6th 2008 to May 16th 2009. After a break for a while, H.E. Soylu organized a series of seminars under the title of “Democracy Meetings” during the course of the Referendum on September 12th 2010, having travelled around Turkey in order to explain the “Yes” choice. Having joined Justice and Development Party (AK Party) in 2012, H.E. Soylu was assigned as the member of Central Decision-Making and Administrative Committee (CDAC) at the 4th Ordinary General Assembly and as the Deputy Chairman in charge of Research and Development. Subsequently, H.E. Soylu was appointed as the Deputy Chairman in charge of Party Organizations in 2014. Having been elected as AK Party Trabzon Deputy of the Terms 25th and 26th and as AK Party İstanbul Deputy of the Term 27th at General Parliamentary Elections held on June 24th 2018, H.E. Soylu served as the Minister of Labour and Social Security under the 64th and 65th Governments. As of September 1st 2016, H.E. Soylu also served as the Minister of Interior under 65th and 66th Governments respectively. Having been re-elected as the Minister of Interior under 67th Government, along with this duty, H.E. Soylu is currently a member of Central Decision-Making and Administrative Committee of AK Party. Having founded a family company on insurance in 1994, H.E. Soylu is married and has two children.